As the question of political status of Abkhazia remains a major challenge to peace and security in the region, the two societies commemorate the events of 1993 in radically different manners. 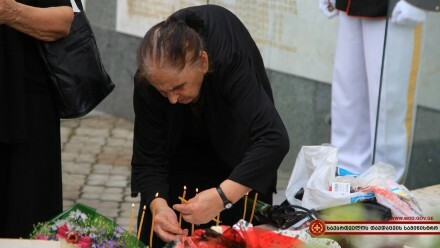 As twenty-two years have passed since the end of the war in Abkhazia, the two societies marked the anniversary of the events of September 1993 in ways informed by radically different historical narratives. 27 September is remembered in Georgia as the anniversary of the fall of Sokhumi. It marks the extrajudicial execution of pro-Georgian members of Abkhazia’s government and an ethnic cleansing campaign carried out by local Abkhaz and foreign fighters. It also remains a tragic symbol for the war itself and the loss of territory. The official commemorations included wreath-laying at the Heroes’ Memorial in Tbilisi. In his speech speaker of parliament Davit Usupashvili mentioned that the government is working on restoring Georgia’s territorial integrity and that the struggle won’t require blood to be shed. Minister of defence Tinatin Khidasheli and chief of staff Vakhtang Kapanadze visited the Vashlijvari Brotherhood Cemetery where symbolic graves of fighters who died in the war are located. A concert of singer Niko Nadirashvili was held on the Freedom Square in Tbilisi. Many news outlets published pieces on the history of the war and memoirs by public figures. Some social network users posted pictures of themselves holding a piece of paper with phrase me sokhumeli var (‘I’m from Sokhumi’) written on it. Another often-seen slogan was chven davbrundebit (‘We will return’). Although 27 September is an important day in Abkhaz historiography being known as the Day of Liberation of Sukhum, more attention is usually paid to 30 September. The day is known in Abkhazia as either the Day of Victory in the Patriotic War of Abkhazia’s Nation or the Liberation Day. It is usually commemorated with pomp and ceremony; a variety of events took place in Abkhazia’s major cities, including art and photo exhibitions, ceremonies of laying wreaths at war memorials, a military parade, an open-air play with elements of military reconstruction called Aiaairaatourykh (‘The History of the Victory’), and a concert of South Ossetian state ensemble Simd. According to news outlet Sputnik Apsny, up to seven hundred school pupils took part in a march called ‘Immortal Regiment’ in which the children carried portraits of war heroes. An official delegation from the Pacific state of Nauru including speaker of parliament Ludwig Derangadage Scotty arrived in Sukhum to take part in the commemorations. Nauru is one of the handful UN members who recognised Abkhazia’s independence. The Abkhazian media was dominated by reports on the commemorative events as well as profiles of people who fell victim to the war, opinion pieces, and interviews with war veterans and public figures. A video called Itabupatynchrazy (‘Thank You for Peace’) was published by mobile company A-Mobail and widely shared in social networks. The video features children listing their family members who died during the war, which is followed by a series thank-yous for peace, freedom, and victory. The turbulent times of Soviet demise saw the Georgian government forces enter Abkhazia in August, 1992 as a reaction to the declaration of independence by Abkhaz members of the local parliament in July. The armed phase of the conflict claimed many victims on both sides and set its long-lasting stamp on Abkhazia’s infrastructure. The conflict also resulted in ethnic cleansing and flight of ethnic Georgians from the territory of Abkhazia causing a major humanitarian crisis in the country, the effects of which can still be felt today. Both the Georgian government and the Abkhazian de facto government failed to address the issue of war crimes committed by both sides during the conflict. Many Georgian observers point out the destructive role of Russia in conflict settlement, while it is widely seen in Abkhazia as a guarantor of security. As the issue of refugees/IDPs remains a strong taboo in Abkhazia, the war imagery is an important component of the Abkhaz nation-building process and is particularly difficult to challenge. On the other hand, the Abkhaz narratives are virtually never included in the Georgian public debate, which is farther cementing the wall of misunderstanding between the communities. As both narratives are strongly influenced by nationalism and are extremely politically charged, they remain irreconcilable and obstruct the possibility for a genuine dialogue on the tragic events of 1992–1993. Parts of the article discuss developments as seen from Abkhazia and doesn’t reflect the view of DFWatch. The word ‘Abkhaz’ refers to an ethnicity, while ‘Abkhazian’ refers to an inhabitant of Abkhazia regardless their ethnic background or an institution based in Abkhazia. Abkhaz names are transliterated according to how they would be spelled in the Abkhaz language.